Both Howth Yacht Club Half Tonners are in the top five overall of the Half Ton Classics Cup in Belgium after six races sailed. What a difference a day makes! After the grey skies and light winds of the first two days, day three of the Half Ton Classics Cup 2018 in Nieuwpoort brought a distinct change of pace for races four to six in the series. Whilst skies were still overcast for the first two races of the day, the wind had already begun to pick up. Race four offered up a fairly consistent five to six knots, for race five it was building to 6-8 knots and by race six the sun was out and the breeze was edging into double figures for a glorious finish to the day. The change of pace brought some new faces to the front of the fleet and gave others a challenge. Jonny Swan's Harmony hit the front for the first time up the first beat of race four and then hung onto her lead all the way to win by forty-seven seconds on corrected time. Toni Stoschek & Janne Tukolas's Superhero and Tom Florizoone's Red Cloud had a superb battle for third which Superhero won by a single second. Overnight leader Robbie Tregear and his crew sailing Per Elisa took fourth with Ian Van Burm's Fantasy fifth. "Jonny Swan's Harmony hit the front up the first beat of race four and then hung onto her lead all the way to win by forty-seven seconds on corrected time"
Race five was Superheroes from the off. They came off the line with pace, shot up the first beat like a scalded cat and finished the race with a two minute and eight-second lead. There was an all Irish dogfight for second and third between David Cullen's Checkmate XV and Harmony. These two are old rivals and with two superbly drilled crews, they clearly enjoyed sparing at close quarters. Checkmate eventually got the upper hand by fourteen seconds. Per Elisa was fourth again with Jacques Lemaire's Waverider fifth. It took two attempts to get race six underway as the fleet almost universally preferred the pin end and there just wasn't room for all of them so out came the general recall flag. Pretty much the only boat clearly not over the line was Per Elisa who had pottered gently in at the committee boat end all on her own. Determined to get them away at the second attempt the race officer brought out his U Flag, meaning that any boat on course side of the line within the final minute of the sequence would be automatically disqualified from that start. Sadly Per Elisa was not as cautious on her second start and she and Father Bruin found themselves out of the race. With the wind now into double figures Checkmate XV found her form and romped home for a win by two minutes and forty seconds. Once again the chasing pack had an increadibly close race and this time it was Harmony who bested the rest, beating Waverider into third place by eighteen seconds. Red Cloud took fourth, General Tapioca fifth and Superhero sixth. In the overall standings with six races now completed Robbie Tregear's Per Elisa retains her overall lead with eleven points, while four boats are separated by just a single point for second and third. David Cullen's Checkmate XV and Jacques Lemaire's Waverider both count seventeen points while Toni Stoschek & Janne Tukolas's Superhero and Tom Florizoone's Red Cloud both count eighteen points, with each pair only separated on count back in that order. Two further points adrift and still very much in contention with up to three races still to sail is Jonny Swan's Harmony. In the Vintage IOR Class, which has been introduced this year to recognise boats still sailing in largely original IOR format, Jacques Lemaire's 1977 Davidson designed Waverider continues to lead the fleet by four points from Ivan Van Burm's Fantasy, a 1980 Humphreys. One point behind Fantasy and tied for third place are Nicolas Lejeune's 1984 Briand designed Skippy's Ton and Albert Pierrard & An Callens' 1985 Nissan designed A+. Thursday's fourth day of racing will feature the long inshore race, which has a 1.5 points weighting, and with the forecast offering a good southwesterly, which is expected to build from around 13 knots up to 17 to 20 knots by late afternoon, it should be a good day for some longer distance racing. After sailing the sailors came together for the daily prize giving where the Harken Winch Handles and Spinlock Deckvest Lifejacket were presented to the race winners. Also presented was the Henri Lloyd Concours d'Elegance Trophy, which is presented to the boat deemed by a secret committee to be the most beautifully presented at the regatta. After much careful inspection of this year's entrants, many of whom are looking absolutely spectacular, the committee awarded the trophy to Paul Wayte's modified and meticulously maintained HB31 Headhunter. Also joining the Half-Ton sailors on day three was Belgian Laser Radial Olympic Bronze Medallist Evi Van Acker who joined the all-girl crew of Half Duke to make a presentation promoting "Mothers & Midwives Support", the charity they are promoting through their participation this week. Mothers & Midwives Support is gathering funds to finance an ambulance boat for the Monvu Hospital and the Idjwi Island in the Democratic Republic of Congo. Their presentation included a short video on the work of the charity and the lives of the Idjwi Island community and the Monvu Hospital, for whom the ambulance boat will provide a vital lifeline. Evi is a patron of the charity and spent time to speak with the sailors and their families about the charity's work and why this ambulance is so important. The evening continued with a delicious crew dinner of Belgian specialities Waterzooi, a stew of fish or chicken, and Stoofvlees, a beef stew, which was both declared to be delicious and were washed down with plenty of Belgian beer. The championship continues until Friday 24 August and will feature a mixture of windward/leeward, short coastal and long coastal courses, with a maximum of three races being sailed each day. There was a deceptive light breeze blowing in the marina as the boats left the dock, but in the race area there was virtually no wind, leaden skies, glassy seas and murky visibility. Up went the postponement flag and the waiting began. Fortunately, Half Ton Sailors are a resourceful lot and various coffee parties and swimming sessions sprang up to keep everyone entertained. Eventually, though a light breeze began to establish itself sufficiently for Charlier to get the fleet underway for race two. With the wind rarely getting above five knots, it was hard work trying to stay in the wind lanes, keep clear air, stay on the right side of the tide and constantly change gears to keep the boats moving. Robbie Tregear's Per Elisa once again demonstrated that she and her team revel in light airs by beating Philippe Pillate's General Tapioca into second place by just over two minutes. Tapioca had had her work cut out to fend off the pack with Jacques Lemaire's Waverider taking third, Tom Florizoone's Red Cloud fourth and Toni Stoschek and Janne Tukolas' Superhero fifth. As the boats came to the finish line for race two the slowly emerging sunshine killed the breeze and so another postponement was hoisted. Fortunately, the cloud returned and the wind filled in again allowing race three to be run. Off the start line the right side of the beat was favoured by the tide and initially looked good, but the breeze was building more rapidly on the left and at the first weather mark the boats from that side had gained a significant advantage. John Hick's 1985 Briand designed Rampage headed the fleet, closely pursued by Waverider, Ian Van Burm's 1980 Humphreys' designed Fantasy and Red Cloud. Per Elisa rounded in mid pack but immediately began to pick off the fleet. By the second weather mark Per Elisa was in the lead from Rampage and Red Cloud with Waverider fourth and Superhero fifth. Per Elisa went on to win the race by sixteen seconds from Waverider with Rampage third by just one second, Red Cloud fourth and Superhero fifth. In the overall standings Per Elisa now has a perfect 1, 1, 1 scoreline to lead the regatta by six points from Waverider, who has jumped up from fourth place, leapfrogging Red Cloud who remains in third with eleven points. Having gone into the day second overall, David Cullen's Checkmate XV was very consistent with two sixth places, but drops down into fourth overall on fourteen points. Superhero was also extremely consistent with two fifth places, which added to yesterday's fifth place means that she remains in fifth overall, just one point behind Checkmate XV. Waverider continues to lead the Vintage Division for unmodified boats, where Skippy's Ton, the 1984 Briand design owned by Nicolas Lejeune, is lying second and Fantasy third. Ashore the traditional daily prize giving saw the Harken Winch Handles being presented to General Tapioca and Waverider and the Spinlock Deckvest Lifejacket to Skippy's Ton. The prize giving was followed by another Half Ton Classics Cup tradition - the Fancy Dress Party, where each team vies for the right to be named as the best disguised. As we write the jury is still out on the question of this year's winner, but for sure there are some spectacular costumes and a good time is being had by all. Looking ahead the wind is due to increase over the remaining days of the regatta. Day three promises eight to ten knots from the west, increasing further into the mid to upper teens for Thursday and Friday. Howth Yacht Club's Dave Cullen in the 1985 Humphreys designed Checkmate XV and Jonny Swan in Harmony, an earlier Humphreys' design from 1980, are both heading for the 2018 Half Ton Classics Cup at Nieuwpoort in Belgium next week. The Half Ton Class makes a welcome return the Belgian port, which will take place from 20 to 24 August 2018 and will be hosted by the Koninklijke Yacht Club in Nieuwpoort. The event will see some 20 vintage yachts built to the IOR Half Ton Rule compete over five days of racing for the prestigious Half Ton Classics Cup and a number of additional special trophies. New for this edition is the introduction of a Vintage IOR Class open to all non-modified Half Tonners (except mast and keel). Among them eleven boats from the local fleet (A+, Fantasy, Half Duke, Petit Izoï, Envol, Skippy's Ton, Farther Bruin, Spip, Ballerine, Red Cloud and Waverider) are already confirmed as competing in this division which is expected to provide some exciting and challenging competition. As always, the event will attract teams from across Europe to compete and this year an Italian crew will be joining the fray for the first time. Sailing the 1989 Berret designed Blue Berret Pi/Team Italia, Jérôme Spilleboudt & Massimo Morasca and their crew come to the event as reigning Italian Half Ton National Champions and are expected to give the fleet a good run for their money. Many of those competing are old friends of the class. From the English west country comes Robbie Tregear's 1992 Ceccarelli designed Per Elisa, whilst Toni Stoschek & Janne Tukolas make the trip all the way from Finland with their 1988 Andrieu designed Superhero. The Belgian home fleet are putting up a good showing with Philippe Pilate's General Tapioca (1978 Berret) leading a strong team that includes Waverider skippered by Jacques Lemaire (1977 Davidson), Ian Van Burm's Fantasy (1980 Humphreys), Maël Danis' Envol (1980 Joubert) and Thibaut Martin's Spip (1984 Humphreys). It is always a delight to see one of Ron Holland's legendary Golden Shamrocks taking part in the Half Ton Classics Cup and this year Half Duke will represent the class with a very special all-girl crew aboard, who will be racing to represent the NGO "Mothers & Midwives Support" which is gathering funds to finance an ambulance boat for the Monvu Hospital and Idjwi Island in the Democratic Republic of Congo. On Wednesday evening of the regatta, the team will present their project in the yacht club, where they will be joined by Olympic Laser Radial Bronze Medalist Evi Van Acker, (a major rival of our own Annalise Murphy from Rio) who is a "godmother" to "Mothers & Midwives Support". Registration for the event will open on Sunday 19th August and there will be practice racing that afternoon. Championship racing runs from Monday 20 to Friday 24 August inclusive and will feature a mixture of windward/leeward, short coastal and long coastal courses, with a maximum of three races being sailed each day. With the overall regatta decided on the penultimate day, the Euro Car Parks Half Ton Classics Cup was presented to Phil Plumtree and the crew of Swuzzlebubble at Kinsale Yacht Club, Ireland on Friday night. A single ‘round the cans’ final race earlier in the day also delivered a full eleven race programme despite losing a day to strong winds. Swuzzlebubble’s series ended on Thursday after ten races of mostly first and second places confirmed their pre-event favourite status and this year’s win is the third victory in the 40-year old boat’s modern record adding to previous wins with Peter Morton and Greg Peck. The battle for second place went down to the wire and the outcome of the eleventh race which was won by Nigel Biggs on Checkmate XVIII and he succeeded in beating David Cullen on Checkmate XV by a half point margin to take the first runner-up place. The Half Ton True Spirit trophy, the other major award for the week was presented to Paul Wayte and the crew of Headhunter in recognition of their camaraderie within the fleet both afloat and ashore but especially for their sportsmanship. Wayte loaned a spare mast to Superhero after their own rig was badly damaged en route to Ireland that enabled the Finnish entry to start the regatta last weekend. Tributes were paid to Principal Race Officer Anthony O’Leary and Regatta Director John Stallard of Kinsale YC with their team of volunteers who delivered a memorable series. Class President Philippe Pilate on General Tapioca was best of the continental entries in fifth overall in the 21-strong turnout. At the prize-giving ceremony, he confirmed that the 2018 championship will be held at the Royale Koninklijke Yacht Club (KYCN), Nieuwpoort in Belgium from the 20th to 24th August where a team of volunteers are already planning a week of great racing and hospitality. Nigel Biggs on his newly-refurbished Checkmate XVIII leads the Euro Car Parks Half Ton Classics Cup at Kinsale Yacht Club after a rain-soaked opening day but only two points separate first to fourth places. Although Phil Plumtree’s two-times past champion Swuzzlebubble had impressive leads on the water, IRC handicapping greatly levelled the playing-field and the iconic Kiwi yacht by designer Bruce Farr could only muster a win in the opening race before scoring second and eighth places for the rest of the day and lies third overall. In contrast, Biggs had two fourth places and a second while Paul Pullen’s Miss Whiplash had a 3-3-4 day and only missed being overnight leader on the tie-break with Checkmate XVIII. Of the host nation, a win in the third race for Howth Yacht Club’s Michael and Ritchie Evans on The Big Picture transformed their day after earlier sixth and fifth places. Fourth overall puts them two points ahead of their clubmate David Cullen on Checkmate XV who also had a race win to counter and eighth and a fifth during the day. Of the conditions, the only dryness were the remarks by visitors of the irony that the committee boat’s name is ‘Irish Mist’ on a soaking wet day with a moderate breeze that built to 20 knots by the final race. Principal Race Officer Anthony O’Leary promised quick windward-leeward races of under an hour and a 0.8-mile beat ensured a fast programme. The prospect of clear skies and breeze for Day 2 will see another three windward-leeward races in place of the planned coastal race as near gale conditions forecast for Wednesday may disrupt the event programme. The fleet has been reduced by one boat as Superhero by owned Toni Stoschek and Janne Tulokas was dismasted in race two. The class had previously rallied to ensure Finnish crew would make the start-line after their original mast was wrecked when a HGV reversed into it while waiting to board a ferry in Holyhead. The Half Ton spirit is especially in the mind of class President Philippe Pilatte of General Tapioca, currently lying seventh overall. “With a good team and good sails, it is possible to race a 40-year old boat competitively,” he said. “It’s all part of the history of yacht racing and keeping it alive; it is ‘competition with roots.’” Feeding back information to the IRC Rating office to help older boats remain competitive with modern designs is also a class priority. Day three of the Henri Lloyd Half Ton Classics Cup was sponsored by Sta-Lok and brought a change of weather and a change of overall leader. After two days of glorious sunshine the sailors found themselves sailing in the infamous Cornish mizzle (a cross between mist and drizzle) with a south easterly breeze of around 10 to 12 knots. The swell had subsided a little, but was most definitely still in evidence and the lighter breeze made it even harder to navigate through. The Flushing Sailing Club Race Committee started the day with a pair of windward leeward races and then set the third course around permanently laid marks in Falmouth Bay with the finish off Port Pendennis. As the event reached the midway point the racing was closer than ever with some new faces coming to the top of the heap and mere seconds separating the leading boats on corrected times. Mike Evans' The Big Picture, whose crew includes Irish Olympian Mark Mansfield and top International Dragon crew Adam Winkelmann, really found their form and were top performing boat of the day with a 1, 3, 2 scoreline. They won the opener by two seconds from Paul Pullen's Miss Whiplash with Greg Peck's Swuzzlebubble third and Jonny Swan's Harmony fourth. Only 46 seconds separated the top six boats on corrected time with Jean-Philippe Cau and Claude Charbonnier's Sibelius fourth and Francis Marshall's Concorde fifth. The second windward leeward race was also incredibly tight. Swuzzlebubble beat Sibelius by just one second with The Big Picture third, David Cullen's Checkmate fourth and Concorde fifth. Race six brought plenty of drama with a huge right-hander on the first beat which caught out Swuzzlebubble and several other leading boats, a hook around the second mark that forced the rounding boats straight back into those still beating in, and Harmony making an enthusiastic port tack mark approach with a stack of boats inside her which created a mini drama all of its own. Fortunately no Half Tonners were injured in the completion of this race in which defending champion Checkmate claimed her first race win of the series with The Big Picture second, Harmony third, Sibelius fourth and Miss Whiplash fifth. With six races now completed the first of two discards comes into play and Swuzzlebubble bounces up the leader board into first place one and a half points ahead of Miss Whiplash. Holding onto third place with a ten point delta is Harmony while Sibelius moves up into fourth a further point and a half back. Fifth and sixth are separated by just half a point with Checkmate just ahead of The Big Picture. With two more days of sailing, up to six more races to sail and a forecast offering everything from six the thirty-six knots between now and Friday afternoon the regatta remains wide open. #halfton – Saint Quay Portrieux - 10 July 2014 -Ireland's Half Ton Classic Cup contenders lie 5, 7 and 8 overall after seven races in France. It was the bravura performance of three straight wins on yesterday's penultimate day, the stunningly restored 1978 Farr designed Swuzzlebubble, owned and helmed by Peter Morton and crewed by Kelvin Rawlings, Anthony Haines, Eouard Lynch, John Kemp, David Lenz and Martin Calmon, claimed the 2014 Half Ton Classics Cup with a day to spare. Behind them the battle for second and third continues to rage, but tonight the delighted Swuzzlebubble crew can relax and enjoy the Half Ton Classics Cup Crew Dinner at the Saint-Quay-Portreiux Casino safe in the knowledge that tomorrow's race is just for fun. And they do intend to race, as Kelvin confirmed after sailing today; "Of course we're going to sail tomorrow. It's been a fantastic week, perfect weather, stunning scenery, great competition: we wouldn't miss it for the world." For Peter this win completes an extraordinary hat trick of Ton Cup victories. His first was the Three Quarter Ton Cup of 1986 in Torquay aboard Graham Walker's Indulgence. Ten years ago Peter was one of the driving forces behind the revival of the Quarter Tonners and he has gone on to win the Quarter Ton Cup no less than four times in three different boats, most recently just two weeks ago. Adding the Half Ton Cup to his trophy cabinet fulfills a long held dream for the man who has been a driving force in yacht racing for the past three decades. Although Swuzzlebubble's victory is confirmed, the remainder of the podium is going down to the wire. Today, two ferociously competitive windward leeward races and a coastal course, around the rocky Iles de Saint-Quay, were run in glorious hot sunshine and a northwesterly wind of around 16-20 knots. Going into the day Brittany Drizzle, Bernard Fornier Le Ray's 1978 Berret, held a narrow two point lead over her sister ship, Philippe Pilate's General Tapioca with Claude Charbonnier's Sibelius (1980 Joubert-Nivelt) and Toni Stoschek's Superhero (1988 Andrieu) both just seven points behind in fourth and fifth. Brittany Drizzle and General Tapioca continued to be at each other's throats all day and were never separated by more than a few second on corrected time. Brittany Drizzle added two seconds and a third to her card and she now holds second place with seventeen points. General Tapioca took second in race five, fourth in race six and third in race seven and hangs onto third place with twenty-one points, still in striking distance of the second step on the podium. Sibelius initially held her own with a fourth and third, but she struggled to maintain her form in the longer coastal race, finishing eighth. Although she remains in fourth place overall, with only one more race to sail tomorrow her thirteen-point delta on General Tapioca means she is no longer able to make the podium. Sadly Superhero had a day of mixed fortunes so she has dropped down the ranking to sixth place, allowing Nigel Biggs' Checkmate XV (1985 Humphries) to move up into fifth overall. At this evening's daily prize giving ceremony several special prizes were handed out including the Furthest Sailed To Take Part Prize, which went to David Evans and his crew of family and friends aboard Hullabaloo VX, who sailed 340 miles from the UKs east coast; and the Gentleman's Prize, for the team felt to best embody the true spirit of the class, which was presented to Richard and Ursula Hollis of Crakajax and from Cowes. Tomorrow one single race remains to be sailed as the Sailing Instructions call for no starts to be made after 11.00. That single start is scheduled for 10.00 and with a forecast for more great weather we look forward to the event going out on a high note as Swuzzlebubble enjoys a lap of honour and Brittany Drizzle and General Tapioca fight it out for second place. #halftonclassics - Probably one of the most scenic short offshore races ever, perfectly describes the course set for today's fourth race at the Half Ton Classics Cup 2014, which took the sailors from Saint-Quay-Portrieux, along the cliffs of Northern Brittany, around the stunning Ile de Bréhat archipelago and back, a distance of just under 40 miles writes Fiona Brown. 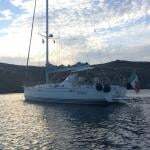 The course required them to dodge rocks, battle the tide and pass through some very narrow passages around the pink granite archipelago, giving the navigators a serious workout. It was also a tough day for the tacticians as they battled their fellow competitors as well as the elements and geography. With a brisk north westerly ranging from 18-25 knots and plenty of lovely warm sunshine it was more champagne sailing for the 22 competing teams with a hearty beat out and a spectacular run home. Initially the course looked very challenging and one or two skippers expressed concerns about the safety of navigating through the narrow channels, but the committee's decision was vindicated and the teams enjoyed a spectacula and safe race. Robert Tregear's Per Elisa got the best start, but from the off Peter Morton's Swuzzlebubble (1977 Farr) looked confident and they put in an outstanding beat to lead by seven minutes at the halfway mark. As they turned for home and hoisted the kite a mentally exhausted Peter handed the helm to Dave Lenz and took over trimming the main. Dave reveled in the surfing conditions and the crew took full advantage of the favourable tidal gate to extended their lead to over ten minutes by the finish line. Although they had a generous lead, Swuzzlebubble is the highest rated boat in the fleet and there was an anxious wait until the results were published confirming that they had beaten Philippe Pilate's General Tapioca (1978 Berret) by two minutes forty four seconds, with Bernard Le Ray Fournier's Brittany Drizzle, a sister ship of General Tapioca, just over a minute further back in third. Back ashore Peter confirmed that it has been a fabulous day's sailing, but joked at the prize giving that "I'm not sure about all those rocks - I think I prefer the mud of the Solent! But it was very pretty." The fight for fourth place was a close one with Toni Stoschek's Superhero (1988 Andrieu), David Cullen's King One (1981 Berret - winner of that year's Half Ton Cup with Paul Elvstrom as skipper) and Nigel Bigg's Checkmate XV (1985 Humphries) finishing in that order within 36 seconds, and a mere two seconds separating Superhero and King One. With four races completed the discard comes into play and in the overall standings Swuzzlebubble now enjoys a five point lead over Brittany Drizzle with General Tapioca two further points back in third. Fourth place is filled by Claude Charbonnier's Sibelius (1980 Jubert-Nivelt), who finished seventh in today's race and is now on equal points overall with Superhero, who takes fifth on count back. As well as the overall trophy there is also a special prize for the Series Half Tonners, which are currently lead by David Evans' 1978 Stephen Jones designed Hustler 32 Hullabaloo XV. David found Hullabaloo rotting in the mud on the River Medway in 1996 and bought her with a view to restoring her and introducing his young family to racing. "She was in such a bad state that I regretted my purchase within minutes of handing over the money." David wryly joked when asked about her restoration. Many evenings and weekends of hard work later and David had the cruiser/racer he had been looking for and he's been racing her with family and friends ever since, as he explained after racing today; "We've been doing the Half Ton Classics Cups since the first one in 2003. It was great, I only had three young children crewing for me so we were a bit pushed, but it whetted our appetites. We missed the next two events, but we were back in Nieuwpoort in 2009 in which we were second overall, so it just goes to show that production boats can do this sort of thing.... We sailed 330 miles on our own bottom to get here with just my youngest son and myself. It's a fabulous holiday and my other son and three friends joined us. Our oldest crewmember is 72!..... 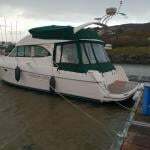 For the price of a reasonable car you can buy a Half Tonner you can go sailing and enjoy yourself, meet lovely people and have fabulous racing!" Tomorrow the boats will return to short course racing with up to four more races being anticipated. The forecast is anticipating more northwesterly winds in the mid to upper teens and plenty more sunshine so it looks like another great day's racing is in store. The regatta continues until Friday. #hyc – Three well known Irish half tonners make the journey to Saint Quay Portrieux in Brittany for the Half Ton Classic Cup representing Howth Yacht Club. The Evan's brothers "The Big Picture", Jonny Swan and Jim Freyne's "Harmony" and Dave Cullen's "King One" will all head in search of trophies in this highly competitive class event which is expecting 32 entries. Following a total refurb and optimisation and following her recent second place in the ICRAs, Michael and Richie Evan's beautiful MG30 will hope to repeat her form to try and clinch the top trophy. A sister ship to the current holder, Nigel Biggs; Checkmate, these two boats should provide some very close racing for the spectators. Harmony, incidentally a previous Half Ton Classic Cup champion in 2007 when owned by Nigel Biggs, could be a dark horse and is still one of the fastest half tonners around. Now looking fantastic following a refit, she may suffer a little from lack of time on the water. King One makes its third trip to the Continent in an effort to take the prize. Placing third in 2009, lying second in 2011 when she broke her mast and lying 4th last year when a black flag ruined any chances, she has some unfinished business!. The Half Ton Classic Cup, sponsored by Euro Car Parks, kicks off with a practice race on Monday followed by 11 races to be held up to Friday next. #halftonclassics – Howth's Dave Cullen sailing King One along with Nigel Biggs steering Volvo Dun Laoghaire Boat of the Week Checkmate is competing in this week's Half Ton Classic Cup this week at the Yacht Club Boulogne (YCB), France from 19 to 24 August 2013. Read more about the resurgence of the classic IOR design in Winkie Nixon's Sailing on Saturday blog.